It was August 2018, when my wife and I had a vacation at a beach resort in Kalkudah, that we first encountered Shiny. The setting and the beach was pristine. As in most areas of Sri Lanka, there were several street dogs surviving on food scraps from the fishermen on the beach. The dogs were constantly chased off by the resort owners as it was considered a nuisance and an eye sore. But here was this special dog, who kept following me around, and the villagers had named her Shiny. She would hunt for sand crabs as food and I would feed her tables scraps on the sly. I did not want her beaten for coming into the resort compound. Something about Shiny stole my heart. I wanted to bring her back with me to America. My wife did not think that was a possibility as we already had three rescue dogs. There was a lady cleaner at the resort who showed compassion and agreed to take care of her until we made arrangements. Back in the US, I continued to think of Shiny and the other dogs. It was Shiny that captivated my heart. We tried for months via friends and family in Sri Lanka to find a home for Shiny but there were no takers. Everyone wanted a puppy or a “ratta balla.” . In January I decided that there was a reason we could not find her a home in Sri Lanka - Shiny was destined to be with us in the US. It is then that my wife and I reached out to The Animal Welfare and Protection Association (AWPA). The AWPA arranged for Shiny to be transported from Kalkudah to Colombo and she was sterilized and provided with the necessary veterinary care needed for her long journey to the US. We are indebted to Shiona, in particular, who visited Shiny regularly and provided us with updates. AWPA facilitated all transportation requirements by selecting a superb company - Pet Travel Lanka. They made everything seem easy, took care of all the paperwork, flights and kept us apprised every step of the way inclusive of photographs of Shiny’s long journey from Colombo to Virginia, USA. Shiny was in excellent health and relaxed, when she arrived after her long trip. 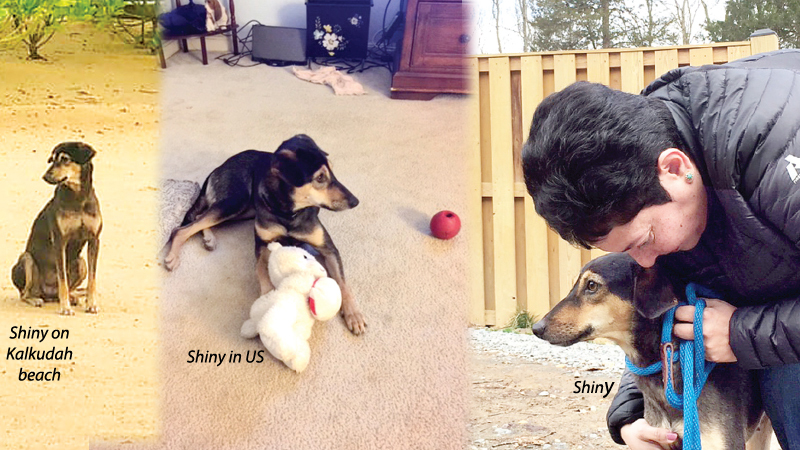 Approximately one month after we contacted the AWPA, Shiny was in our home in the US. Within a couple of days Shiny now rules the house, with three other rescue dogs, playing and enjoying her new life which brings us tremendous joy. She has gained three pounds since arriving! Shiny recently received a gift bag of toys and treats from a dear friend of mine saying “welcome to America”! It was hilarious to watch her carry the entire bags and start eating the treats. She took the stuffed toys, one of which was an elephant, to bed with her. Absolutely adorable!